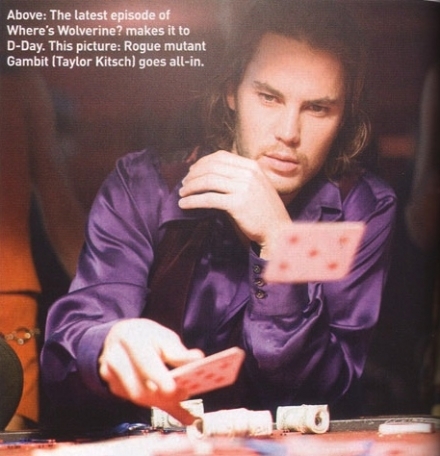 First Look: Taylor Kitsch as Gambit in "Wolverine"
Empire Magazine showed the first official photo of Friday Night Lights star Taylor Kitsch as Gambit in Gavin Hood’s "Wolverine". Attendees at Comic Con were lucky to see an early preview of the film which featured Gambit in action (which I had a bootleg of it here on the boards before it was taken down, pretty cool clips). Gambit first appeared in Uncanny X-Men #266 in August 1990. Created by writer Chris Claremont and artists Jim Lee and Mike Collins, Gambit is skilled in card throwing, hand-to-hand combat, and possesses the ability to manipulate kinetic energy. A profesonal thief and self described ladies man, the character has had a longtime on and off again romantic fling with Rogue. Wolverine will be the character’s first appearance in a movie. The fan favorite has appeared in previous televion cartoons and video game releases. The character was supposed to make a small appearance during the prison convoy scene of X-Men: The Last Stand, but Marvel decided the role was too small for the character. James Franco supposedly auditioned for the part. The Wolverine movie trailer will be attached excluvely to The Day The Earth Stood Still. Gambit and Wolvie were my favorites when I was a young mexican. I look forward to this movie and now I have another reason to watch the day the earth stood still.